Welcome to Bugysoft. The main purpose of the web site support is to share worldwide our product MDI2DOC, whitch targets to manage MDI files. Feel free to use MDI2DOC, to buy a commercial edition that will save your time or to request a personal modification that will comply with your wishes. We are glad to announce you about the new product - MDI2DOC Converter (what's new?) Please note, previous version MDI2PDF is now obsolete and no longer supported. 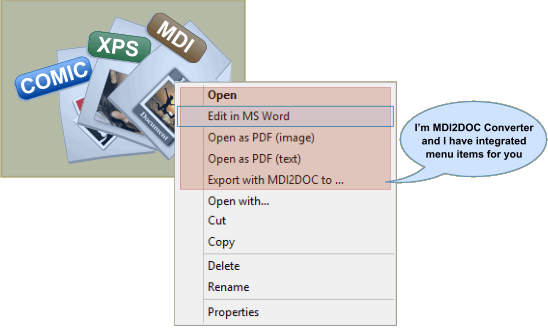 All the features of MDI2PDF are supported by MDI2DOC. Issued Licence Keys are compatible with both versions. MDI2DOC Converter is an easy-to-use file viewing and converting utility, designed to export MDI or any other image files to MS Word in order to edit them or convert them to PDF are the de-facto standard data presentation format. We have also made an effor to provide an easy access to conversion options by integrating export shortcuts into windows shell. If you just need to view or convert one or thousand of files, located in one or many different folders into various file types, this is the tool to use. MDI2DOC - MDI Viewer has an easy-to-understand navigation interface. Depending on your needs, you can choose edition that suits you the best. The advanced edition allows batch conversion. FREE edition includes base functionality for viewing files and exporting them to ordinary image files, like JPEG or BMP, with no limitation. With free edition it's possible to export to PDF, but with watermark. FREE edition has no time limits. LIGHT edition has got no annoying pop-up messages, every-quarter essential updates are manual only. In this edition it's possible to work with numerous documents at the same time and create PDF documents with no watermarks. In other words, light edition gives great opportunity to PROTECT your main investment - SAVE YOUR TIME. PRO edition allows an export to searchable PDF or even DOC for editing MDI files, including original formatting if possible. PRO edition supports command-line facility to automate file conversion. It is possible there to encrypt PDF files with owner or user password. ULTRA includes powerful user-interface for batch file conversion enabling to create hundreds or thousands of PDF and JPEG files in a few clicks only. Easy to search, easy to add, easy to convert. Every output formats has got own flexible settings. MDI2DOC Converter 5.1 - have added support for viewing and export of XPS and Comic book file format. Testing of new product - MDI2DOC Converter 5.01 is complete. Ready to make public.